"To be the company that best understands and satisfies the product, service and self-fulfilment needs of abrasive—globally." Carbo Panel understands that business value cannot be achieved through technology alone. It starts with right products and services: suitable products and good collaboration from us enhance the development of perfect solution for your requirements. We believe this is match is what led us to success. "Carbo Panel satisfy customer like you to make calibration and finishing process simple for everyone." Our powerful technology produce products that your calibration and finishing processes simple for everyone. We insist three top assurances for our products - long lifespan, consistent quality and good price - to fulfil your requirements. 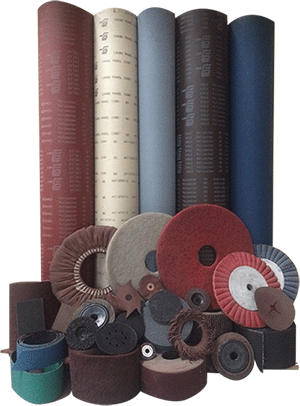 Carbo Panel is a leading and pioneer manufacturer for abrasive products locally and globally for more than 25 years. We specialize in delivering and customizing thoughtful solutions to resolves customers’ problems and improve efficiencies. We have entered and supply to more than 25 countries around the world now. Carbo Panel enables you to transform your raw material to aesthetically attractive surfaces of your end products. By bolstering your ability to harness the right products, we help you become more agile and competitive. We are constantly innovating and increase our product range which includes sanding belts, segmented belts, foam pads, Velcro rolls, flap wheels, sliding pad and etc. We provide these wide ranges of products to provide our customers with ‘one stop’ abrasive process solutions in four main industries: Wood and Panels, Automotive, Metals, Diverse Materials. Our company expands and allocates numerous sales teams globally to priorities high customer engagement by providing premium services and products solutions to cater your needs. We emphasize strong commitment and its efforts to provide its customers with competent local consulting services for the right products.